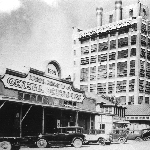 The community of Imperial is a redevelopment of a site formerly occupied by the Imperial Sugar Company, the oldest continuously operating business in the State of Texas, who processed sugar on the site for more than 160 years. In fact, this strong connection to the ISC is what gives the community of Sugar Land its name. The original sugar refinery, which had been in continuous operation since the mid-1800s, was closed in 2003. The refinery housed a vast historical treasure trove of artifacts, documents, and photographs that traced the evolution of the site from its early days as a working plantation into its more modern era as a company town. In 2008, the Sugar Land Heritage Foundation was created to make sure the priceless artifacts and the history of the site were preserved. In 2010 structures in the area were imploded in order to accommodate future redevelopment plans, such as the community of Imperial. An extended history of the Imperial Sugar Company, as well as a history of the redevelopment site, is available on their website.